Do you remember these blocks of Coleman Highlands? In this area of Coleman Highlands, census records from 1920-1940 detail large households of several children headed, most often, by a manager or salesman. Census records from 1920-1940 show a two-block area of Coleman Highlands as a thriving section of the Midtown’s Redemptorist Parish – its well-built homes packed with large Catholic families. 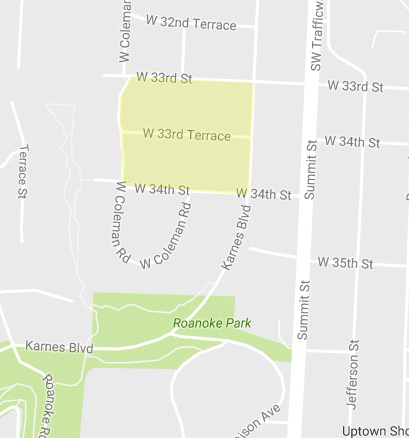 A reader asked for more information about W. 33rd Street Terrace in Coleman Highlands, so today’s look back at history includes the area from the south side of W. 33rd Street to the north side of W. 34th Street between Coleman Road and Karnes. Many of the homes still standing on this block were already occupied by families when the 1920 census was done. The homes were mostly owned rather than rented, and occupied by families including both first-generation Irish, English and Russian immigrants alongside those born in the United States. Large families were common, not surprising as this area of Coleman was advertised as part of the Redemptorist Parish, the area around the large Catholic church at Broadway and Linwood. A handful of households had a live-in housekeeper or other servant, while others counted a boarder or two among their household members. The men of these homes worked middle-class jobs as grocery store owners, building contractors, stockyard and board of trade workers. Several daughters worked as teachers. By 1930, many of the families who lived on these blocks had moved on, replaced by other middle-class families. The heads of household most often listed their occupations as managers and salesmen, along with some city workers, a police department employee, a dentist and a lawyer. Chief of Detectives Edward Doyle lived at 924 W. 34th Street. Two households had servants in this census report. A decade later, in 1940, many of the families had changed again. This census again shows families with several children, which often included extended family members such as mothers-in-law, sisters-in-law and cousins. Salesmen and business managers were still among the most popular occupations, living among steam railroad workers, public school teachers and custodians. The following are some of the census records available for the area between 1920 and 1940. 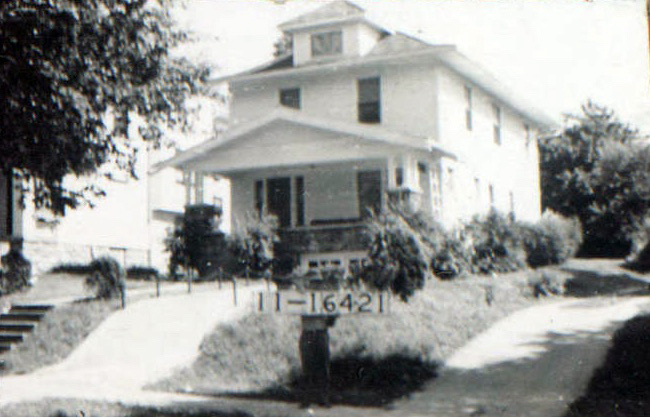 914 W. 33rd Street in 1940. 943 W 33rd Street: Irish-born county marshal Timothy Casey lived here with his wife Mary, three daughters and a boarder. 937 W 33rd Street: Grocery store proprietor Elizabeth Kerner, the Nebraska-born daughter of German parents, lived here with her three daughters and two boarders. 925 W 33rd Street: John C. Lynch, who worked in the cement industry, lived here with his wife Mary and two sons. 919 W 33rd Street: Russian immigrant Solomon Brenner, a saloon owner, lived here with his wife Kay, two daughters and a son. 915 W 33rd Street: Building contractor Edwin Alexander lived here with his wife Louise, a son and a daughter. 910 W. 33rd Street Terrace: Manufacturing company machinist David Dietrich, son a German parents, lived here with his wife Margaret, two sons, two daughters, and boarder named Louis Powers. 926 W. 33rd Street Terrace: Packing company traffic clerk Michael Solan lived here with his wife Margaret and three daughters. 930 W. 33rd Street Terrace: Delia Keane, who worked as a clerk in a grocery store, lived here with a boarder, Mamie Farrell, a salesperson in a dry goods company. 934 W. 33rd Street Terrace: Oscar Bishop, a son of German parents who worked as a doorman at a newspaper office, lived here with his wife Theresa, two daughters and a boarder. 936 W. 33rd Street Terrace: Scott Kennedy, who worked as a stockman at the stockyards, lived here with his wife and son. 944 W. 33rd Street Terrace: Government supervisor Orrin Noyes lived here with his wife and three sons. 948 W. 33rd Street Terrace: Irish-born Thomas Crowe, manager of a baking company, shared this home with wife Margaret, two daughters and a son. 950 W. 33rd Street Terrace: Irish-born Bridget Leonard headed this household. Her six daughters and two sons, aged 17 to 32, held jobs as teachers, clerks and stenographers. 911 W. 33rd Street Terrace: Oculist Robert Beaumont owned this home with his wife Emma, six daughters, two sons, and mother-in-law. 917 W. 33rd Street Terrace: Public accountant Joseph McShane owned this home, where he lived with his wife Nonie, three daughters, two sons, and a North Carolina-born servant named Dorthea Clark. 925 W. 33rd Street Terrace: A 28-year-old woman named Alice Helm owned this home, where she lived by herself. 929 W. 33rd Street Terrace: Anna J. Ryan, the daughter of Irish parents, owned this home that she shared with three sisters and a niece. 933 W. 33rd Street Terrace: Grocery store owner Walton McFarland owned this home with his wife Minerva and a son. 935 W. 33rd Street Terrace: Cigar company manager Edwin Oberholtz lived here with his wife Elizabeth and four sons. 937 W. 33rd Street Terrace: Thomas McLiney, a grain man at the board of trade, lived here with his wife Mary, his father-in-law and his sister-in-law. 943 W. 33rd Street Terrace: City lawyer Arthur Smith lived here with his wife Mary and his sister-in-law. 949 W. 33rd Street Terrace: Street contractor Mathais Mense shared this home with his wife Sophia, three daughters and two grandsons. 3304 Karnes: Dry goods store owner George Govier lived here with his wife Lunah, a daughter, and a Kansas-born servant named Beulah Tumer. 3310 Karnes: Irish immigrant Bridget Donovan lived here with her four daughters. 3318 Karnes: House contractor Bert H. Nelson lived here with his wife Lola, a daughter and mother-in-law. 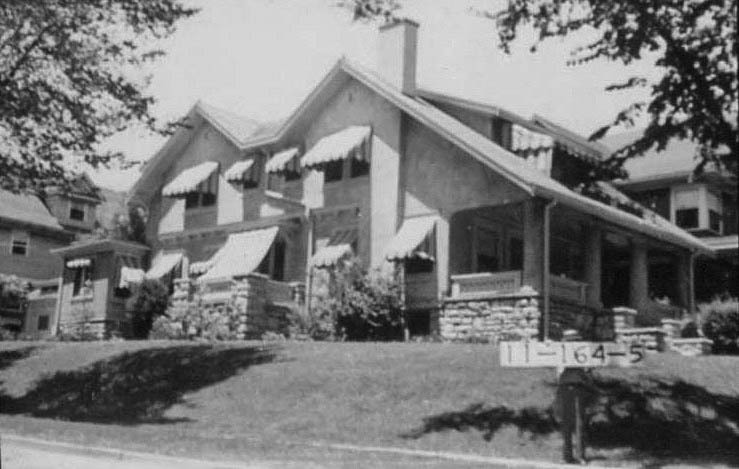 3344 Karnes: Calvin B. Norton, the owner of a jewelry company, owned this home with his wife Louise, daughter Edith and a boarder named George Cowley. 920 W. 34th Street: Walter P. Krause, owner of a roofing company, owned this home with his wife Augusta, three sons and Missouri-born housekeeper Dorthea Adams. 924 W. 34th Street: Grain dealer Frederick Hoose owned this home with his wife Alice, a son and a daughter. 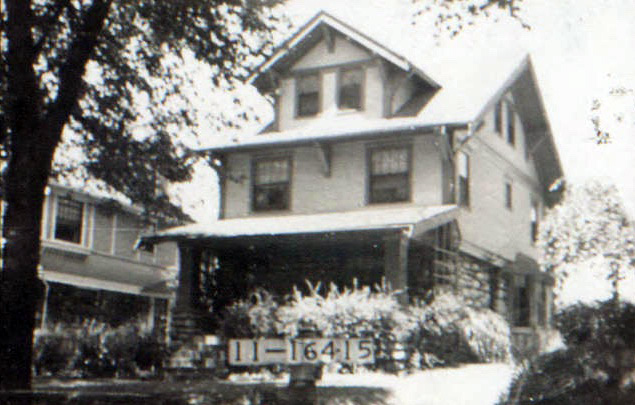 928 W. 34th Street: John C. Long, a general contractor, owned this home with his wife Bertha and two sons. 916 W. 34th Street: Thomas Harvey, an insurance broker, owned this home with his wife Mary, a son and a Missouri-born housekeeper named Laura Barber. 918 W. 34th Street: Shoe store owner William Toller owned this home, shared with his wife Adele and two daughters. 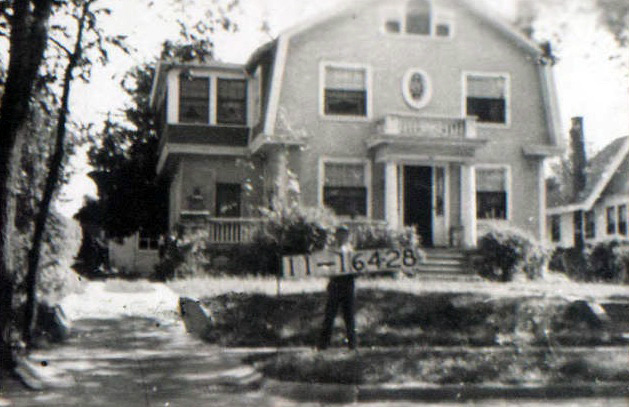 3406 West Coleman Road: English immigrant Richard Bowen owned this home with his wife Mary. 3308 Karnes: Frank Barry, a hosiery salesman, lived here with his wife Margaret and servant Inez Swain. 3330 Karnes: Real estate salesman Walter Norton rented here with his wife Mary and daughter Louise. Also listed at this address were Jeremiah F. Leary, a grain operator with the board of trade and his wife Anne. 3334 Karnes: Arthur Riddle, whose occupation was listed as kraft cheese manager, rented here with his wife Mardje and daughter Rose Marie. 3338 Karnes: Life insurance salesman Phillip A. Stark owned this home, shared with wife E. Helen. 3326 Karnes: Stock dealer William Wilkin lived here with his wife Anna and two sons. 3330 Karnes: James Rose, a grocery salesman, lived here with his wife Ida May. 3334 Karnes: Scottish-born Theophilus Paton, a sewing machine district manager, lived here with his wife Clara, son and daughter-in-law. 3338 Karnes: Assistant flour mill manager Harold Thompson rented here with his wife Helen and daughter. 3344 Karnes: Wholesale jewelry merchant Calvin Norton owned this property with his wife Louise and daughter. Jewelry store manager Earl McD. Mann, his wife Eva and son rented here as well. 911 W. 33rd Terrace: Edward Geraughty lived here with his wife Annie, daughter-in-law and two grandsons. 917 W. 33rd Terrace: George McKim, office manager for a paint company, shared this home with his wife Fay, a daughter and his father. 921 W. 33rd Terrace: Paper and bag company salesman Chester Adams lived here with wife Kathleen and two sons. 923 W. 33rd Terrace: Retail grocery merchant Walton McFarland lived here with wife Minerva and a son. 925 W. 33rd Terrace: Wholesale produce merchant Herbert Zeigler lived here with his wife Florence, two daughters, two sons and a niece. 929 W. 33rd Terrace: Storage warehouse owner William Sammis lived here with his wife Berenice, a daughter, a son and a servant named Nova Minter who was born in Missouri. 935 W. 33rd Terrace: Edwin C. Oberholtz, sales manager of a tobacco company, lived here with his wife Elizabeth, three sons and a granddaughter. 937 W. 33rd Terrace: Grain operator Thomas F. McLiney lived here with his wife Mary and a sister-in-law. 943 W. 33rd Terrace: Lawyer Arthur F. Smith lived here with his wife Mary. 949 W. 33rd Terrace: Maththias Mense lived here with his wife Sophia and two daughters. 910 W. 33rd Terrace: Carpenter David Dietrich lived here with his wife Maggie and a daughter. 914 W. 33rd Terrace: Music teacher Mollie Solan lived here with her mother Mary. 916 W. 33rd Terrace: George Carman, a theater carpenter, lived here with his wife Jessie and two daughters. 926 W. 33rd Terrace: Michael Solan, a water department inspector, lived here with his wife Margaret and three daughters. 930 W. 33rd Terrace: Western Union Telegraph company timekeeper Delia Keane lived here with a boarder, streetcar conductor James Harlow and a servant, Lovina Graham. 934 W. 33rd Terrace: Public accountant Homer F. Goodwin lived here with his wife Sue. 936 W. 33rd Terrace: Livestock dealer Scott Kennedy lived here with his wife Fern, two sons and a daughter. 940 W. 33rd Terrace: Harry J. Curl, bookkeeper for a police department, lived here with his wife Anna. 944 W. 33rd Terrace: U.S. Army officer James A. McCallan lived here with his wife Lillian, a son and a daughter. 948 W. 33rd Terrace: Bakery manager Thomas Crowe lived here with his wife Margaret, a son and a daughter. 950 W. 33rd Terrace: Bridgett Leonard, who gave her country of origin as Northern Ireland, owned this home, which she shared with four daughters (three of whom were teachers) and a son. 940 W. 34th Street: German-born real estate company secretary Adolph Meyer lived here with his son Gus and housekeeper Ida Frantz (originally of Pennsylvania). 930 W. 34th Street: English immigrant Mary Squire Morse lived here with her daughter Esther. 928 W. 34th Street: John C. Long, a building contractor, lived here with his wife Bertha, two sons and Missouri-born servant named Emilie Oetting. 924 W. 34th Street: Chief of detectives Edward Doyle, whose parents were listed as from the Irish Free State, lived here with his wife Kate, mother-in-law, sister-in-law, two nieces and a nephew. 920 W. 34th Street: Dentist Frank B. Miller lived here with his wife Ruby, two daughters and his mother-in-law. 918 W. 34th Street: William H. Toller, a retail shoe merchant, lived here with his wife Adele, two daughters and a son. 916 W. 34th Street: Plumbing company salesman Ralph B. Mason lived here with his wife Mary and a stepson. 912 W. 34th Street: Music store owner Charles Crawford lived here with his wife Ella. 947 W. 33rd Street: Bottle cap manufacturing machinist Frank Schaefer lived here with his wife Magdoline and two daughters. 943 W. 33rd Street: Custodian Timothy Casey lived here with his wife Mary, a daughter and two lodgers. 941 W. 33rd Street: Walter Silkenat, a grocery store manager, lived here with his wife Ruthe and a daughter. 937 W. 33rd Street: John O’Brian, a paint mixer, lived here with his wife Catherine, a son and two daughters. 935 W. 33rd Street: Lawyer Edmund Smith lived here with his wife Anna May and three daughters. 925 W. 33rd Street: Mary Lynch lived here. 923 W. 33rd Street: Lawyer Eugene Donnelly lived here with his wife Norine, four sons, a mother-in-law and two daughters. 919 W. 33rd Street: City social worker Ida Brenner lived here with her mother. 915 W. 33rd Street: Steam railway mail clerk George Brown lived here with his wife Grace and a daughter. 910 W. 33rd Street Terrace: Maggie Deitrich lived here with her daughter. 914 W. 33rd Street Terrace: Consulting engineer Glenn Boyer lived here with his wife Josephine and a daughter. 916 W. 33rd Street Terrace: William Cardwell, an insurance company clerk, lived here with his wife Beatris, his mother, grandmother, aunt, mother-in-law and two sisters-in-law. 926 W. 33rd Street Terrace: Michael J. Solan, a water department meter reader, lived here with his wife Margaret and three daughters. 930 W. 33rd Street Terrace: Laborer James Hanloy lived here. 934 W. 33rd Street Terrace: Income tax accountant Homer Goodwin lived here with his wife Sue. 936 W. 33rd Street Terrace: Drugstore pharmacist Edward Stack lived here with his wife Louise. 942 W. 33rd Street Terrace: Widow Anna A. Curl lived here. 944 W. 33rd Street Terrace: Steam railroad brakeman Fred Lint lived here with his wife Myrtle, daughter, grandson and niece. 948 W. 33rd Street Terrace: Assistant Transportation Commissioner for the Chamber of Commerce Tom Slattery lived here with his brother, sister and a cousin. 950 W. 33rd Street Terrace: Bridget Leonard lived here with her four daughters. 949 W. 33rd Street Terrace: Public school teacher Ida Mense lived here with her sister, mother, son-in-law and daughter. 937 W. 33rd Street Terrace: Thomas McLiney lived here with his wife Mary, a sister-in-law and a niece. 935 W. 33rd Street Terrace: Post office sub-clerk Gilbert Jones lived here with his wife Erma, two daughters and a son. 933 W. 33rd Street Terrace: Grocery store manager Walton McFarland lived here with his wife Minerva and a son. 929 W. 33rd Street Terrace: Ernest Hayes lived here with his wife Ruth, two sons and a daughter. 921 W. 33rd Street Terrace: Sales manager Chester Adams lived here with his wife Kathleen, a son and a lodger. 911 W. 33rd Street Terrace: Edward Geraughty lived here with his daughter-in-law and a grandson. 3301 Coleman: Grocery store manager John Renner lived here with his wife Marie and a son. 3318 Karnes: Carpenter Bert Nelson lived here with his wife Lola, a daughter, a granddaughter, and two boarders. 3338 Karnes: Furniture store manager Otto Bernard lived here with his wife Ida. 3344 Karnes: Steam railroad traveling accountant Roy Lee Underwood and his wife Effe lived here. Also listed at this address was Edward Corbett, a music company warehouse superintendent, and his wife Edith. 912 W. 34th Street: Vincent O’Flarity, in the real estate business, lived with his wife Josephine and three sons. 916 W. 34th Street: Social Security Board Social Worker Mary Mason lived here with a servant named Gertrude Taylor. 918 W. 34th Street: Television school registrar William Toller lived here with his wife Adele, two daughters and a son. 920 W. 34th Street: Frank Miller owned this home, which he shared with lodger William Brinkman, who worked for the public service commission. 926 W. 34th Street: Orson Davis, a motor car dealer, lived here with his wife Mary Beth. 928 W. 34th Street: Retail mensware salesman Harvey Morrison lived here with his wife Lute, a lodger and the lodger’s son. 922 W. 34th Street: Esther Pierson, a librarian at the public library, lived here with her sister Stella, a public school librarian, another sister and a niece. 926 W. 34th Street: Newspaper pressman Curtiss Glenn lived here with his wife Bernice and his mother-in-law. 940 W. 34th Street: Savings bank bookkeeper George Reichel lived here with his wife Dorothy. 944 W. 34th Street: Appliance store salesman Frank Biggs lived here with his wife Eloise. This slideshow shows the homes from the south side of 33rd Street Terrace to the north side of 34th Street. And this slideshow includes homes from the south side of 33rd Street to the north side of 33rd Street Terrace. Thanks so much as always for putting this compilation together. I know it must have taken quite a bit of time! Just for you to know, I ended up buying about a dozen of your books during the Christmas time for the Coleman Highland welcome baskets. They’re beautiful. And, in addition, in case one of the neighbors don’t get your e-mails, I’ll pass this onward for all that have e-mail to read. Would love to get some information on the 800 block of East 31st Terrace/Glenairy Place. It’s one of those narrow no sidewalk streets with a ally running down the back.. Walt Bodine said it was originally called Glenairy Place and much later was changed to 31st Terrace. I grew up at #811 from 1958 to 1968. Oh, and it lies between Campbell and Charlotte. Thanks! Awesome! How can someone go about getting a high-res version of one of the photos? I would love to have a print of that in our house. Can you tell me about 948 W 32nd Terrace? My friend, Herbert Ziegler, Jr will be delighted with the information you found. He and his parents and brother and 2 sisters live in the house on 925 W. 33rd Terrace. He remembers the good times he and his family had living there. He remembers a lot of the neighbors. He had told me about the house and the neighborhood. I printed the information for him. He has been sick with a bad case of the flu. I would love to know the history/architect of my home at 3321 Karnes Blvd. I have lived there several years and find it quite a unique home. I would love the history and any other information on 3234 Karnes Blvd. I grew up in that house and have always loved the neighborhood.